“Once upon a time, in Texas..” If the next chapter of your life story includes a move to North Central Texas, MilitaryByOwner has the scoop on what to expect. 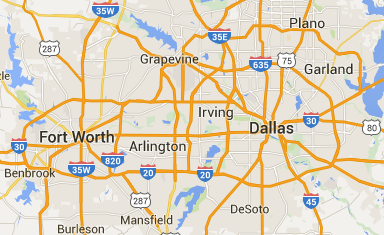 Included in the Dallas/Fort Worth (DFW) area are the Army and Air Force Exchange Service (AAFES) headquarters and Naval Air Station Joint Reserve Base Fort Worth (NAS Fort Worth JRB). If a move to the DFW area is in your future or you're a homeowner or landlord already, find out more about this area as well as a special offer from MilitaryByOwner just for you! An office of the Department of Defense, the Army and Air Force Exchange Service (AAFES) is the main retail entity for everything from stores to movie theaters to restaurants on military installations. In 2015, a dividend of $237 million was provided to military installation quality-of-life (MWR) programs from AAFES profits. From the headquarters in Dallas, employees at the AAFES complex oversee goods and services for over 2000 facilities, worldwide. No matter if Navy, Marine Corps, Army, Air Force, or Texas Air National Guard, all receive a warm Texas welcome at Naval Air Station Fort Worth Joint Reserve Base. Although relatively small in size, NAS Fort Worth JRB hosts around 40 separate commands. Notable for being the first Joint Reserve Base created, NAS Fort Worth JRB serves as a solid resource for military support and training. Living just east of Dallas for a couple of years, our family took full advantage of the long, warm summer season. Temperatures do rise to the upper 90’s, but it seems that nearly every neighborhood has a refreshing community swimming pool. Another option to beat the heat is to “boat and float”! The Lone Star state includes an abundance of lakes and reservoirs. A sunny day with friends may include renting a boat from a local marina, grabbing drinks, snacks, and pool noodles and floating in the water like a carefree buoy! After months of sitting outside sipping sweet tea in warm sunshine, the late fall and winter weather may leave you feeling a bit chilled. However, mid-winter temps are usually in the mild 50’s. Allow me to walk you through a sample floorplan of homes found in the Dallas/Fort Worth area. The phrase “everything is bigger in Texas” seems to apply to the architectural trend. Walking in the front door, your eyes are immediately drawn upward to cathedral ceilings and sky-high windows of the foyer. An elegant staircase leads to upper level bedrooms, bathrooms, and often a loft space frequently used as a children’s playroom. Meanwhile, on the main level you may find the master bedroom retreat. This grandiose room may include a designer’s tray ceiling, a bay window with bench storage, or staggeringly large walk-in closets. Add in all the little extras you’d expect in a decadent on-suite bath and the room just may have the charisma of Sue Ellen Ewing. In our neighborhood, most every Sunday was “family day.” Parents invited their children, grandchildren, and even aunts, uncles, and cousins over for a Sunday meal. To host all those hungry folks, most homes include a good-sized kitchen adjoining to a sizable family room which may open to a slate or concrete patio. Located off the kitchen, a home may have a handy mudroom/laundry room that leads to a spacious 2- or 3-car attached garage. Yard size tends to vary by neighborhood, but most are landscaped and fenced. Due to lingering warm weather, some properties may include an in-ground hot tub and pool. The best part? As you may have noticed with listings on MilitaryByOwner, what seems like a “McMansion” of a home may actually be quite affordable! Catch a bird’s eye view of the city from the unique observation deck of the Reunion Tower in downtown Dallas. Score a ticket to a game at the giant American Airlines Event Center where the NBA Dallas Mavericks and NHL Dallas Stars play. Reflect on the legacy of President John F. Kennedy with the tactful exhibit at the Sixth Floor Museum at Dealey Plaza. Build a robot or shake with a simulated quake with interactive fun at the Perot Museum of Nature and Science. 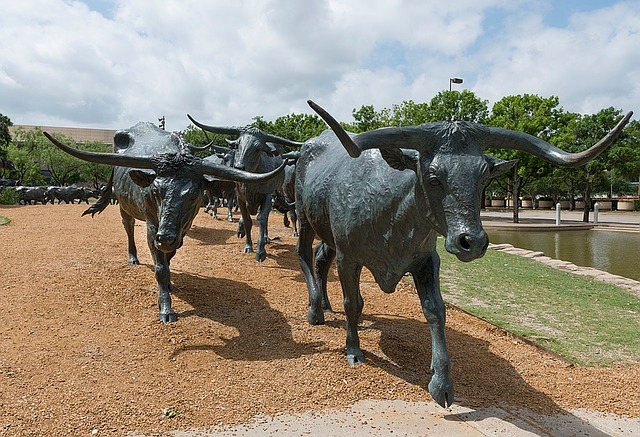 Pose for a selfie with the comely cattle drive themed sculptures at Pioneer Plaza. 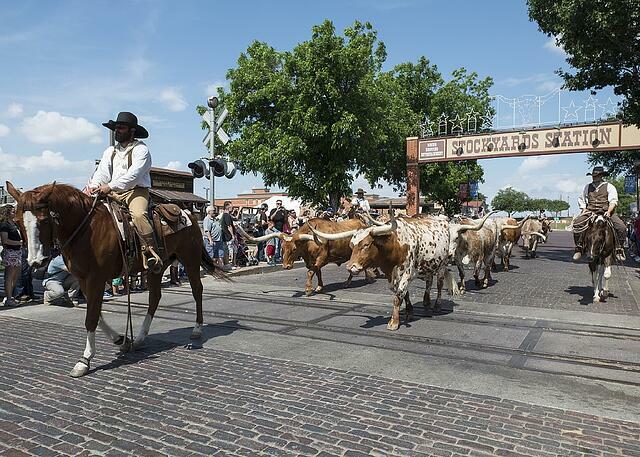 Stroll the cobblestone streets of the historic Fort Worth Stockyards district and dance the two-step at Billy Bob's Texas dancehall and event center. Catch a pop fly at the MLB Texas Rangers ballpark or lead a cheer next door at the NFL Dallas Cowboys stadium. Look for local discounts for Six Flags Over Texas amusement park and nearby Hurricane Harbor waterpark. Learn of pioneer life with Fort Worth’s Log Cabin Village living history museum. Saddle up for a family-friendly trail ride at Benbrook Stables. If you do anticipate a move to North Central Texas, here’s hoping for a happy ending to your Lone Star story! Check out this Limited Time Offer from MilitaryByOwner for Dallas/Fort Worth Home Sellers and Landlords! Looking to sell or rent your home? MilitaryByOwner has a Limited Time Offer exclusively for properties listed in the Dallas/Fort Worth area. Contact our friendly Customer Service team for details and eligibility at 866.604.9126.